A member of crew aboard a Cornish fishing boat attempting to sail from the UK to Australia was injured after being knocked over by a wave. Mark Maidment broke his leg after Spirit of Mystery was struck by freak weather off Kangeroo Island, near southern Australia. The voyage is being led by sailor Pete Goss, and his 14-year-old son and brother are also on board. The boat is sailing to a point where Mr Maidment can be airlifted to hospital. Mr Goss said: "There was no warning, just a huge wall of water that smashed into the boat rolling her more than 90 degrees onto her side. "She just shook herself off and came upright; but when she did, Mark's leg was broken." "He has been a bloody hero. It is a great shame for him, especially so close to the end. She just shook herself off and came upright; but when she did, Mark's leg was broken. Doctors flew out to the boat, 300 nautical miles off Australia, to drop medical supplies. Mr Maidment's condition is described as "comfortable and stable" but it was decided to airlift him to hospital at the "earliest opportunity". Spirit of Mystery is travelling to be within helicopter range (about 120 nautical miles off the coast). The wave also washed away Spirit of Mystery's life raft and dinghy, but the remainder of the crew hope to arrive at their final destination of Melbourne on 9 or 10 March. 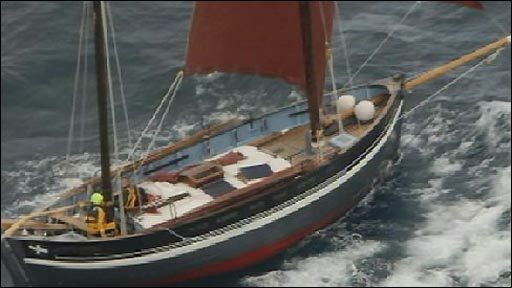 The specially-built wooden Cornish lugger set off from the Cornish port of Newlyn in November. The crew are retracing the journey made by a group of Cornishmen 154-years-ago, who travelled to Australia hoping to mine gold. Like them, they are relying on sail power and navigating by the stars.